Stitching? What is that? | NJNA is Blogging! Today was our break day and Rosie and I sure took a break from stitching! 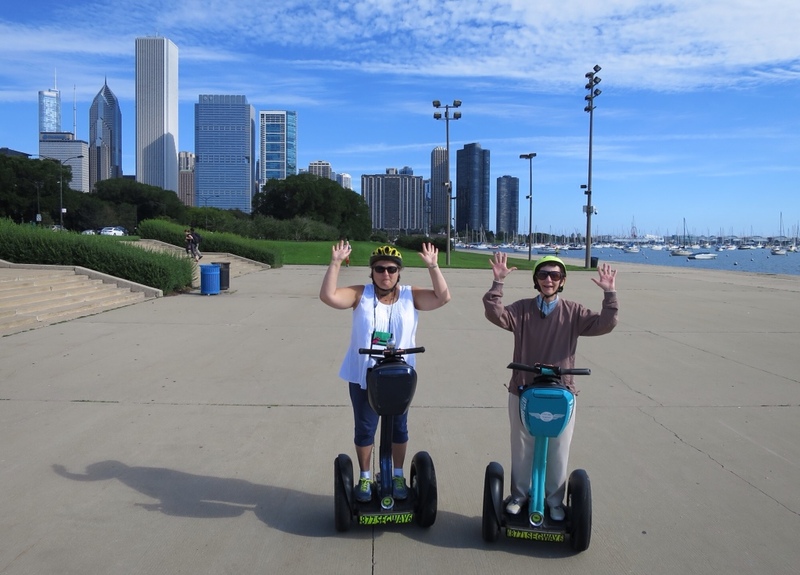 We began the day with a Segway Tour along the lake front to the museums. We began in a large concrete floor room where we learned how the Segway operates. It was so easy that by the time we slowly rode out the door we were adept. No spills or collisions the whole trip! We were with three others, a father with two sons about 12 and 15. The ride along the waterfront gave us views of the yacht basin. With stops along the way, Joe, our tour guide, pointed out many of the buildings we saw as well as the Buckingham Fountain. We did see the outside of the Shedd Aquarium which was the first sea water aquarium away from the ocean. Until the early 60's sea water was brought in by rail from Key West, FL, by tank cars! 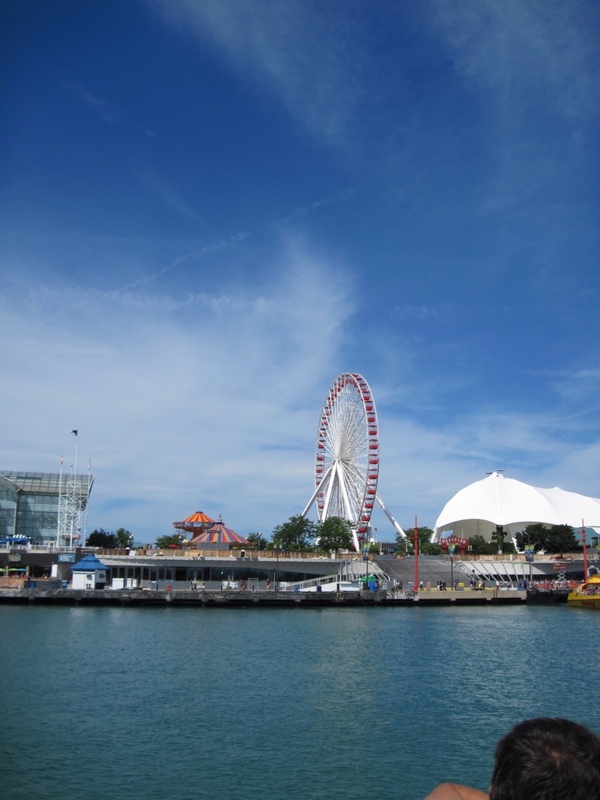 The whole experience lasted about two hours and was a exhilarating way to see the lake front of Chicago. Ask me tomorrow what muscles are aching. After lunch was the River/Lake Architecture Cruise. Meg, may I pay you in cookies for the excellent advice to take the cruise which includes both the river and lake front? Our guide was excellent. She knew all the buildings and told us interesting as well as trivial information about each. 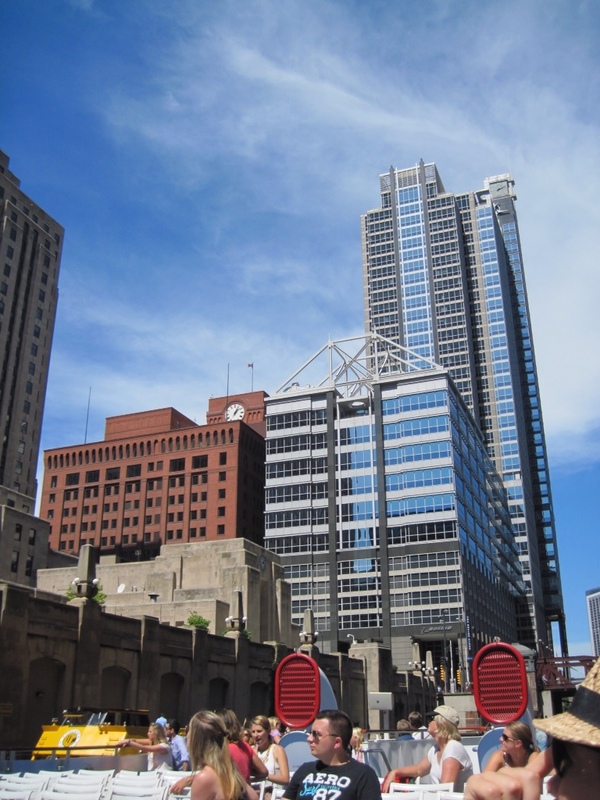 This building is above the rail lines going into Union Station. It is held up by cantilevers in the large X on the roof! Imagine that. This tour included the lake as well so we were able to go though the lock (and watch all the mechanical operations that went with it) as we moved from river to lake. Some of the buildings that we had seen in the morning were against pointed out on this tour. 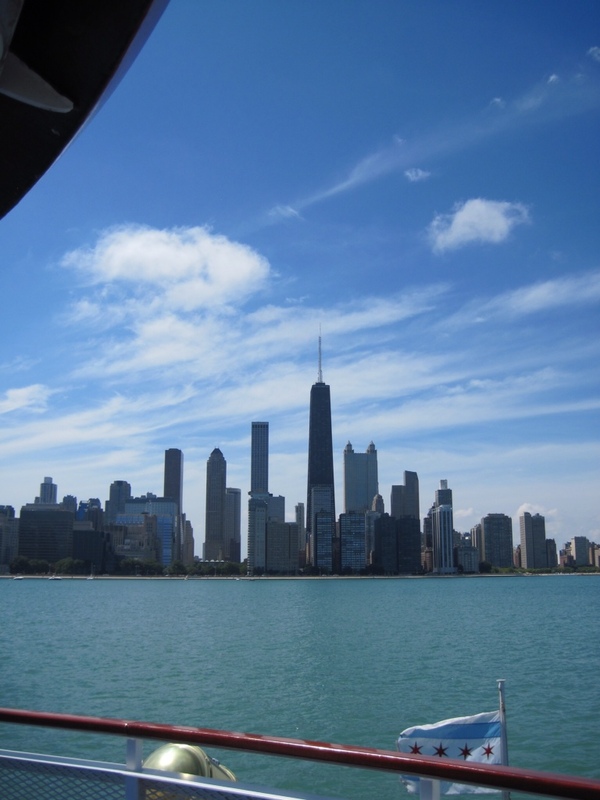 In one spot we could see the four tallest buildings in Chicago. We saw the Millennium Park which I have not yet walked to and hope to fit that in tomorrow. Chicago has a great deal to offer and at least today we were able to see and experience some of that. Tomorrow it is back to stitching! Thank all of you posting to this blog! Because of your detailed narratives, I feel I’m there. Were you able to carry purses, shopping bags, etc. while riding the segways?